Neale and Janet McQuistin with the 65,000gn Airyolland Castro and its new owners Christine and Paul Tippetts. A Beltex breed record was set when a shearling ram from Newton Stewart breeders Neale and Janet McQuistin went under the hammer for 65,000gn. Sold at the breed’s annual official show & sale at Harrison and Hetherington’s Borderway Mart in Carlisle, March-2017 born Airyolland Castro is a home-bred son of Airyolland Asulam, out of Airyolland Tramp. He sold to Williams and Tippetts for their Wilodge flock at Lodge Hill Farm, Shifnal, Shropshire. Next best at 15,000gn was from north-east breeders Ross and Kirsty Williams, who run the Black Jack flock at Upper Tullochbeg Farm, Huntly. January-2017 born Black Jack Casanova is an ET son of Padkin Sugar Daddy, out of Callacrag Paris. He sold to Messrs Hall, Carlisle. Other leading prices for shearling rams included 7,000gn for Tiree Captain, by Callacrag Wise Crack and out of Tiree Annette, from Alasdair MacLean, Heylipol Farm, Isle of Tiree. Captain, second at the Royal Highland Show in June, sold to the Page Farm Partnership based in Ripon, North Yorkshire. Messrs Munro, who run the Loandhu flock at the Stables, Loandhu, Fearn, paid 6,000gn for Eildon Caper, by Callacrag Barbarian, from Messrs Maxwell, Faughhill Farm, Bowden, Melrose. The Copland family, which runs the Orkney flock at Overhouse, Harry, Orkney, paid 5,000gn for Ardstewart Chisum ET, by Langlands Trojan, from W&A McCrabbe, Gortaquigley, Co Donegal, Ireland. 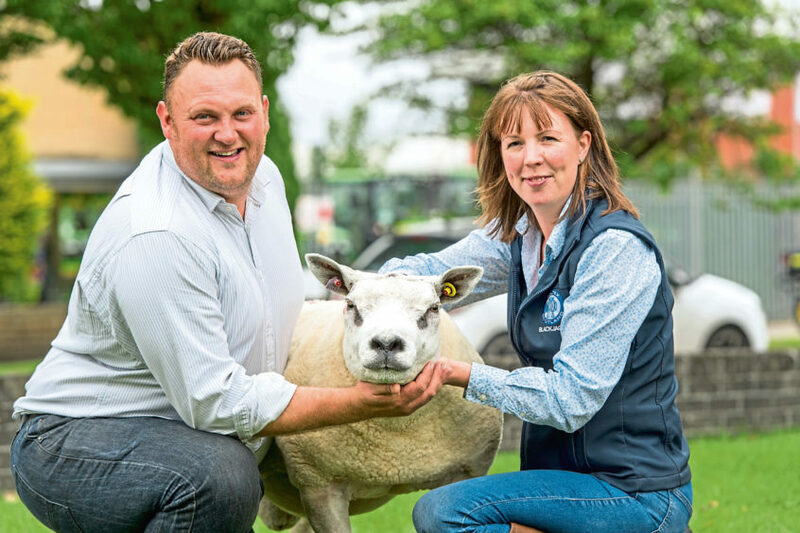 North-east breeder Stuart Wood, who runs the Woodies flock at Woolhillock Croft, Skene, Westhill, achieved 4,600gn selling a half share in Woodies Creed ET, by Carrigans Bob Lee Swagger, to the Aviemore flock of Colin G Mair & Partners, Muirfield, Everton of Auchry, Cuminestown, Turriff. He also made 4,500gn selling Woodies Colour Code ET, also by the same sire, to Messrs Davies, Llanellie, Carmarthen. Also at 4,500gn was Aviemore Cicero ET, by Airyolland Avicii, from Colin G Mair & Partners, selling in a two-way split to Lewis, Llanwrda, Dyfed, Wales, and Mathias, Llanwrdd, Carmarthen. In total, 708 shearling rams sold to an average of £1,211.81. This is back £14.11 on last year’s sale. Ram lambs sold to a top of 10,000gn twice. One of the sale toppers was February-born Clary Donegal ET by the 7,000gn Hackney Braveheart, and out of Clary Winnie ET, from JL McMillan, Carse of Clary, Newton Stewart. He sold in a four-way split to Messrs Burke, Brechin; Messrs Wylie, Kirriemuir; Stuart Wood, Westhill; and Procters Farm Ltd, Lancaster, Lancashire. Other leading prices for ram lambs included 4,200gn for February-born Kingledores Destroyer ET, by Clary Chancer, from Richard T Wood, Benshaw Cottage, Kingledores Farm, Tweedsmuir. He sold in a two-way split to Rory Machray for his Bilboa flock at Daviot, Inverurie, and Colin G Mair & Partners. In all, ram lambs averaged £1,256.23 for the 184 sold, back £206.90 on the year before. 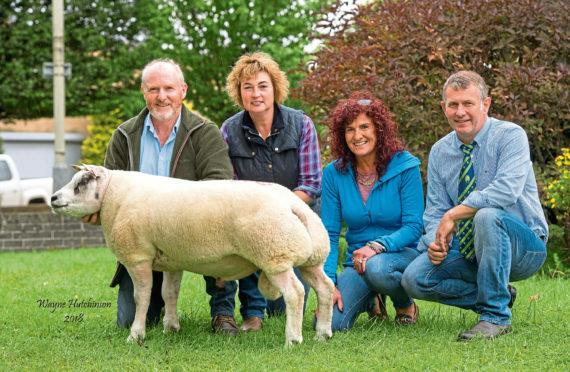 Aged rams sold to a top of 3,000gn for three-year-old Myna Actor, by Corra Rambo, from Procters Farm Ltd, Tatham Hall Farm, Wray, Lancaster. He sold to Messrs Armstrong, Cockermouth, Cumbria. The average for aged rams was £1,333.50 for 20 sold. This is down £122.50 on last year’s sale average. Lastly, in the female section, a top price of 7,500gn was paid for a gimmer named Heber Park Carmen, by Buckles Balmoral ET and out of Heber Park Ariettie. Put forward by DW & KCB Shuttleworth, Heber House Home Farm, Gargrave, Skipton, North Yorkshire, she sold to Messrs Williams & Tippetts. Next best at 6,200gn was a gimmer named Todhall Cider, by Rathbone Alien, from IA Wainwright & Sons, Todhall Farm, Dairsie, Cupar. She sold to Messrs Carroll, Edendiack, Huntly. Perthshire breeder Ian Reid, who runs the Osprey flock at Isle Cottage, Methven, paid 4,000gn for a gimmer named Kingledores Connie ET, by Glantre Armani, from Richard T Wood. Thereafter, 3,500gn was paid for gimmer Callacraig Chambermaid ET, by Hackney Braveheart. Put forward by Andrew Baillie, Carstairs Mains, Carstairs, Lanark, he sold to Messrs Yarr, Edzell, Angus. In total 261 shearling gimmers sold to an average of £791.89. This is back £44.36 on last year’s fixture.